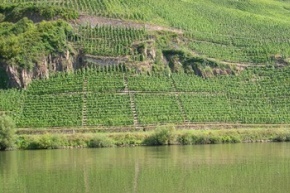 The Mosel has enchanted me and many explorers who came before me with the almost mystical, meandering river-induced slate stone strength that can be transmitted through this most extraordinary of grapes, Rhine Riesling. 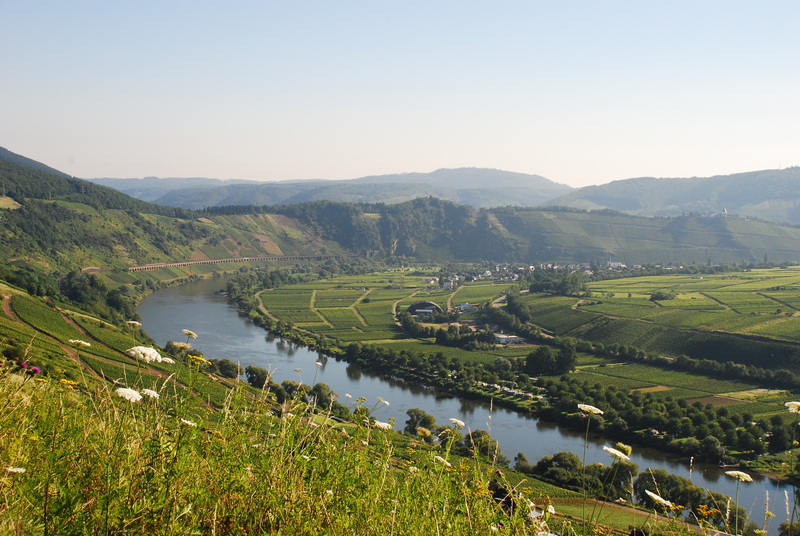 On the banks of the Mosel river in the village of Pünderich, Clemens and his wife Rita live in a 17th century house that looks across the Mosel right in the face of the grand cru vineyard appellation, Marienburg. 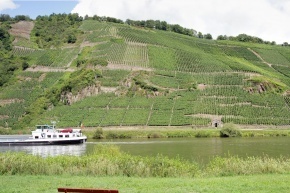 Pünderich is located north of the most famous grand cru terroirs, in the direction of the Rhine river. This is Clemens’ luck, since he does not aspire to follow a conventional protocol, nor does he aspire to protest the status quo for the sake of protest. Wise man indeed (and woman since it must be stressed that theirs is an equal cooperation between man and wife), Clemens’ focus is on what is valuable along the south-facing slopes of the Mosel river, Rhine Riesling, which is at home in these parts as well as the luck of being able to profile gray, red and blue slate terroir. They own 11ha of vineyards up to 70 years old. We had great time when Clemens was in Prague in September. After five years Clemens Busch honored us with a visit to Prague. Some of us still had in remembrance the last, and first, time Clemens came to Prague. At the time I had my wine cellar in Vinohrady. He arrived and set up on my long dining room table. Guests arrived and the afternoon and evening came and went with tasting 21 different Rieslings from the same vintage, all from Clemens, different degrees of complexity, shades of gray, red and blue. It is similar to Burgundy grand cru terroirs, in that it really makes sense to individualize the different characteristics with separate bottlings. On Thursday, 5 September in the afternoon we hosted a professional tasting at Laboratorio, see www.cucina.cz. Once again the program was intense. However this time only 12 samples were tasted. It was after all a guided tasting and many of our guests had to go to work afterwards. I visit Clemens a few times a year, and even for me the tasting was an experience. Here are a few bits of interesting information. Clemens was born into wine. The family winery has existed always, i.e. the first records of the Busch family working in wine date back to the 17th century. They were already vintners then. Even earlier there was a company register in this part of Germany and the Busch family is registered as living and working the land in Pünderich. Since 1974 Clemens has worked full-time in the winery. Clemens has worked organically for over 30 years. He works naturally out of conviction. 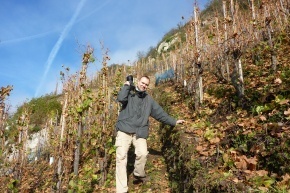 In the 1980’s and ’90’s Clemens looked on in amazement as his colleagues used more herbicides in the steep, sloped slate vineyards along the Mosel river. 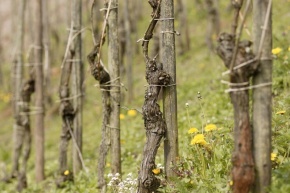 Less weeds and grass between vine stocks has resulted in major erosion, in addition to the obvious negatives associated with poisoning the earth. In 2005 Clemens went further, certifying his estate as bio-dynamic under the certification organization Demeter. He had long been working according to these agricultural principles, and it was a personal satisfaction to take this official step. 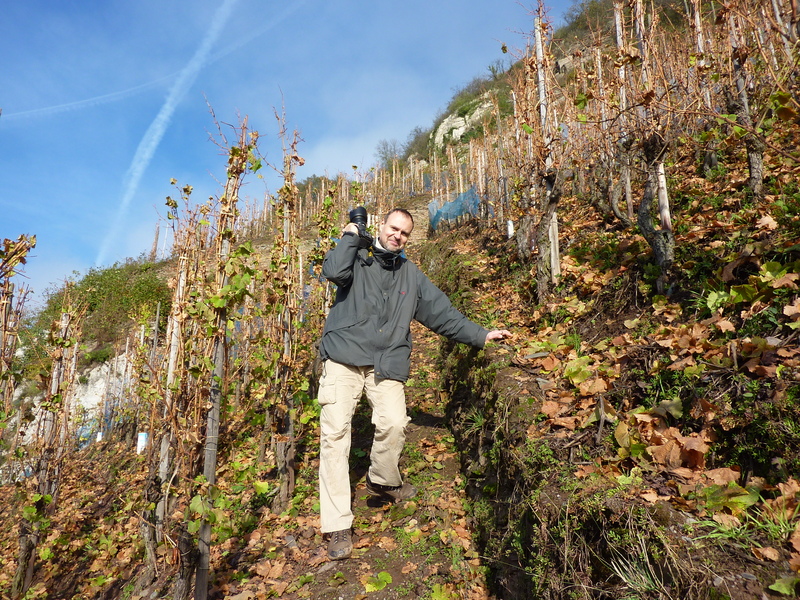 Clemens is the most natural producer I have tasted on the Mosel, and in Germany, and the layman would never notice. Logically this work ethic does not stop at the cellar doors. 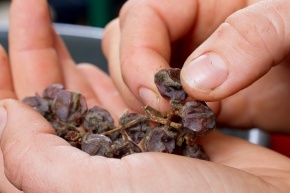 In his cellar Clemens works without technological or chemical manipulation of the grape mass. 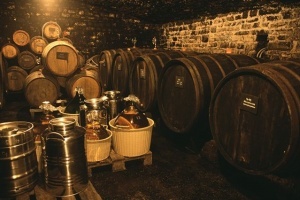 No added yeasts, no temperature control (except for the winter seasonal influence), fermentation in stainless steel and/or Mosel 800-1000l used barrels with longer skin contact than is usual on the Mosel, and aging in the same Mosel barrels. Fermentation usually finishes before the summer following the harvest, sometimes after the summer, and sometimes the following year. The wines are neither clarified nor micro-filtered. Spending the afternoon with 25 wine professionals on that Thursday invariably led to interesting topics, one being the authentic Mosel character of Clemens’ Rieslings. 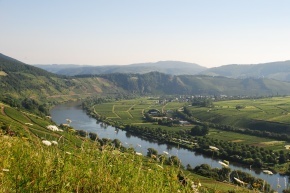 Conventional Mosel Riesling show low alcohol, acidity and a feinherb or semi-sweet character. When Clemens took over from his father until 1999, Clemens and his wife Rita decided to producer only dry wines. 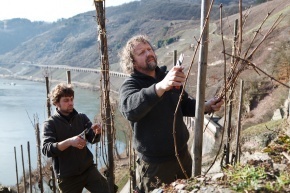 They were tired of the typical feinherb or edelsüss (noble sweet) Mosel wines and wished to profile the Rhine Riesling grape variety and more importantly the strong terroir expression of the steilhang (steep slope) slate the Mosel is famous for. Residual sugar in wine covers its subtle nuances. They concentrate on dry wines to accentuate finesse and increase drinkability. 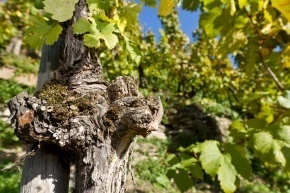 The 1999 vintage was so rich in noble rot that they turned out edelsüss wines. Ever since Clemens has been turning out both dry and sweet wines, i.e. until the 2012 vintage. Last autumn was a very difficult vintage. 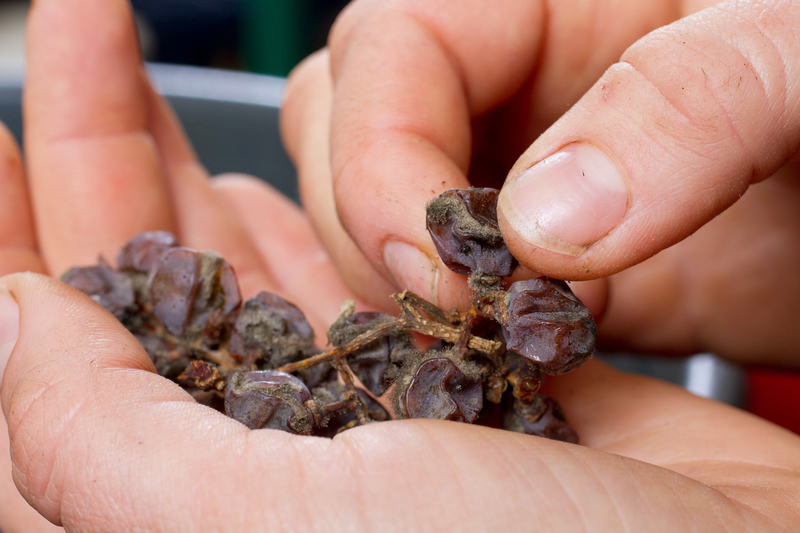 It rained a lot and it wasn’t possible to extend the hanging time of the grapes over a long period and make noble rot selections. 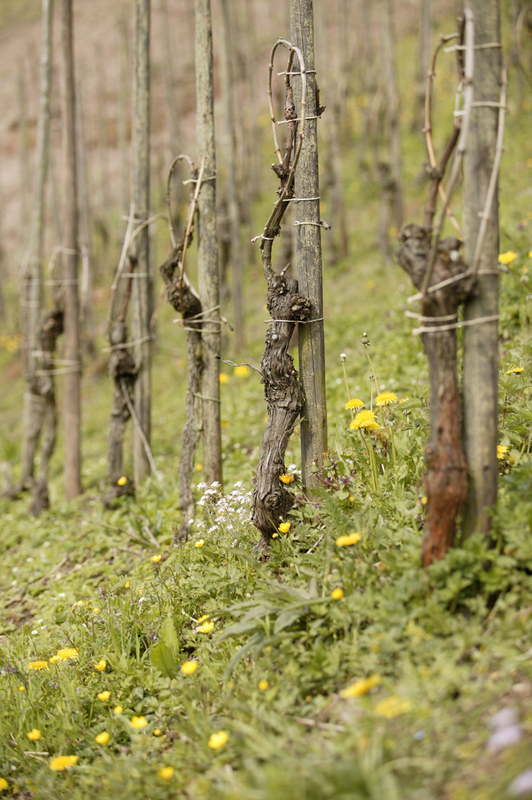 Thus 2012 was the first vintage since 1998 with only dry wines. The last 20 years have been fortunate vintages for most wine producers in Europe. Global warming has led to better ripening and improved weather conditions during harvest time. Ever so often a bad vintage does come along ever so often. When Clemens was last in Prague he was asked to pick out the best vintages during his tenure. After a moment of hesitation Clemens replied that he experienced one miserable vintage and another rather mediocre vintage. End of quote. There was a moment of silence while the audience picked up on what Clemens had said. The audience was amused. The point is clear, great producers do not produce bad wines, not even in inferior vintages. A comment on residual sugar in wine is appropriate when dealing with Mosel Riesling. Riesling is truly an extraordinary grape variety, which can appear very subtle, elegant and feminine. Then robust northern European dishes are served, and the Riesling remains very present on the table. It has a naturally high acidity level, even when grapes are fully ripened as in the case of Clemens (and all our producers). 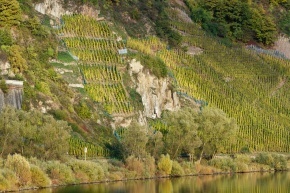 Most German Riesling producers use selected yeasts and later purposely block fermentations to retain a higher residual sugar level in the wine, than their counterparts in Italy. Riesling does well with some residual sugar. Clemens uses only natural yeasts and no technological or chemical devices to manipulate the fermentation process. Nevertheless, due to his important vineyard positions, vineyard work and natural wine-making, the wines have their own temperament every vintage and every cru. Sometimes the wines retain some residual sugar, and whereas residual sugar in non-sweet wines in Italy would be an absolute no-no for me, Mosel Riesling is the exception to the rule. If you have the same no-to-residual-sugar approach, try Clemens’ wines anyway, drink, enjoy, spend time with the wine, and I think they will convince you as they have me.